Serves 3 as a side salad. Soak cashews in filtered water to cover for 2 hours, then drain them.Combine cashews, water, orange juice, lemon juice. Agave or honey, and salt in blender and process until mixture is very smooth. Add olive oil, nutmeg and cinnamon and continue to blend for another minute. 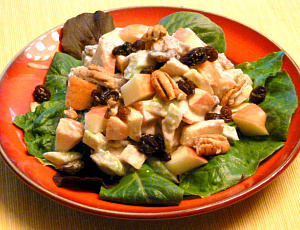 Mix apples, raisins, celery and walnuts together. Blend salad dressing with the apple mixture and serve on romaine leaves. You can add more orange juice if the mixture seems too thick.